What do Lady Gaga, Peggy Lee and Leslie Orofino have in common? All are tremendously talented, very fierce women. And on April 12 and 26 actress/singer Leslie brings her show “Shine” to BJ Ryan’s Magnolia Room in Norwalk, highlighting the music and lives of Lady and Peggy. As well as 2 other fabulous entertainers, Alberta Hunter and Dorothy Fields. The 4 women had very different styles. Leslie romps through them all: Broadway, blues, jazz, contemporary. You name it, she sings it. And how. In World War II, Leslie’s father spent months as a German prisoner. Mary wrote to him — every day. When he finally came home, they enjoyed 60 years of love. Leslie is drawn to these remarkable women’s lives and music because they too overcame major obstacles. Lady Gaga faced mental illness; Peggy Lee, physical and mental abuse; Alberta Hunter, racism, and Dorothy Fields, Broadway sexism. All found strength. All became stars who shined. On April 12 and 26, Leslie Orofino shines her brilliant light on them. This entry was posted in Entertainment, People, Restaurants and tagged BJ Ryan's Magnolia Room, Lady Gaga, Leslie Orofino, Peggy Lee. Bookmark the permalink. 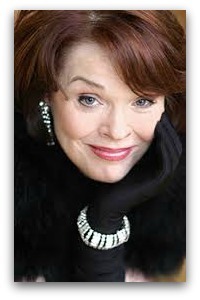 I’ve seen Leslie perform several times, latest was her Cole Porter show. Leslie has a dynamic stage presence, a wonderful rapport with her audience and is a wonderful storyteller as well as a singer. Thanks for this heads up. These WW2 vets really are our greatest generation.